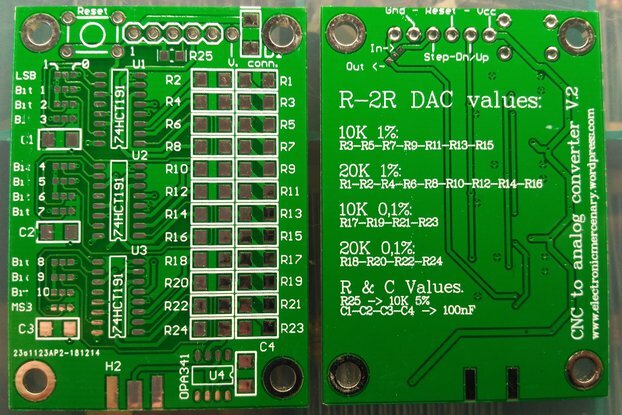 A PCB to convert/mix R/C PWM-like signals into dual H-Bridge compatible PWM and direction signals as used by many popular H bridge boards. A PCB to convert and mix R/C PWM-like signals into H-Bridge compatible PWM and direction signals as used by many popular H bridge boards. 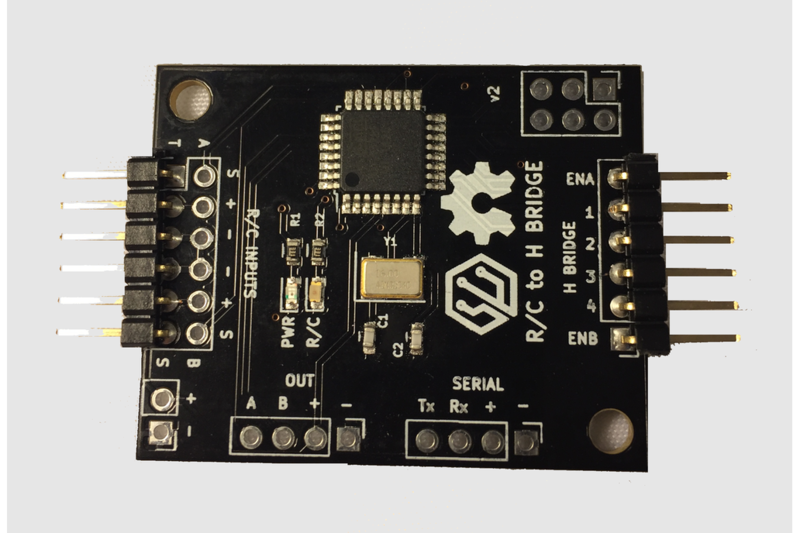 This allows the separation of the R/C signal processing from the H bridge, such that you can combine this board with small to very large H bridge boards. The default firmware for this board handles the mixing of the Throttle and Steering channels to drive two differential motors, aka "Tank Style". It also has two AUX inputs that map to two digital outputs that allow R/C channels to toggle the outputs LOW and HIGH based on the R/C value. This can be useful to add things like weapon arm/disarm, self-righting mechanisms, lights, etc. 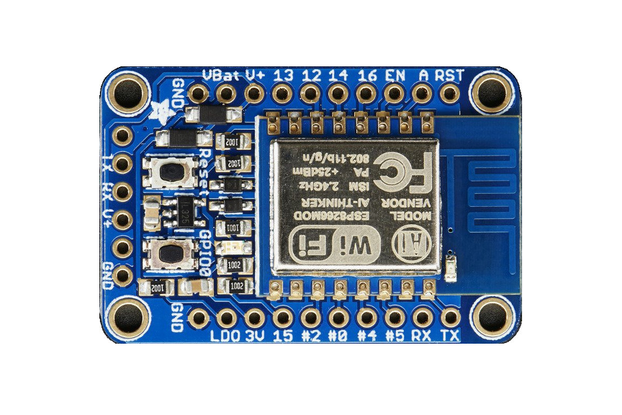 Many H bridge boards in the 2A range are available on Amazon quite cheap, such as This one or This one. The board requires 5VDC power to operate. It can be powered either from the R/C inputs (which usually come from the R/C receiver which gets power from the ESC or BEC) or you can power directly to the + and - port next to the R/C inputs. If powering via the dedicated power port, you should disconnect the + in on the R/C inputs. The R/C inputs connect directly to an R/C receiver. By default R/C center is 1500uS, and max throw is +/- 500uS in each direction. All R/C inputs have a Dead Zone which when the input is +/- this value from center (1500uS) the value will not trigger any change in outputs nor apply power changes to the motors. The default Dead Zone is 25uS. The H Bridge side of the board is designed to interface to H-Bridge with either 4 or 6 pin controllers. The EN pins contain the PWM signal and the corresponding 1/2 or 3/4 pins will either be LOW/HIGH or HIGH/LOW based on the mixed input of the throttle/steering R/C signals to control the direction of the motors. The actual PWM signal format will depend on if the board is in 4 or 6 pin mode. This is detailed in the next section. The PWM signal is also affected by if breaking is enabled or not. To connect 6 pin H Bridges, simply connect the ENA/1/2 pins to the first motor inputs and ENB/3/4 to the second motors inputs. To connect a 4 pin H Bridge, connect ENA/1 to the first motor and ENB/4 to the second. The 1 and 4 pins will toggle between LOW and HIGH to control direction. If you need to change motor direction and cannot do so by reversing the motor wires, you can use pins 2 and 3 instead. 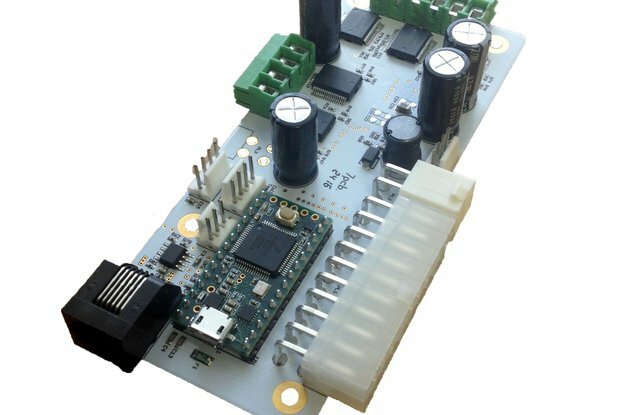 This firmware supports 6 and 4 pin dual channel H-Bridge boards. The format for the PWM signal is different depending on the PWM mode as well as if breaking is enabled. The mode can be adjusted by placing the board in configuration mode. To enter configuration mode, make sure the R/C transmitter is on, place a jumper across the H-bridge pins 2 and 3 and then power on the R/C to H-Bridge board. At power on, if the board sees H-bridge pins 2 and 3 connected together, it will go into configuration mode. After the desired configuration mode is set by using the steering channel, unplug the power to the R/C to H-Bridge board and remove the jumper between H-Bridge pins 2 and 3. Powering the board will start it up in normal mode, outputting the new mode to the PWM pins on the H-Bridge. If breaking is enabled (PWM modes 2 or 4), then if the throttle is in the forward direction and you switch the throttle into reverse, rather than instantly flipping the motors into reverse, a breaking operation is sent to the H-Bridge. It will remain in the breaking state until the throttle returns back to center, and then the next time the throttle goes into reverse the motors will actually be driven in reverse. The OUT ports A and B toggle from LOW to HIGH based on the R/C input signals connected to inputs A and B. There is also 5v power available on the OUT port. This port is designed as an expansion port for future use and/or hacking. 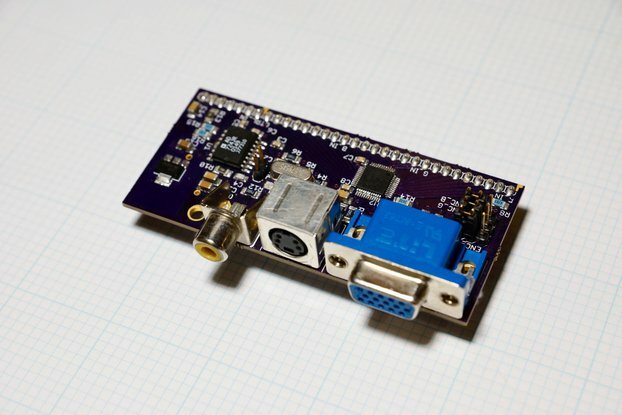 It provides a TTL serial connection to the ATMega chip along with 5v power.